If you’re planning a trip but still haven’t decided where to, we’ve got some great reasons why Lanzarote should be top of your list. The island is perfect for a fun-filled family holiday, offering countless leisure and entertainment options for enjoying with the youngest members of the family. So check out our list of the TOP 8 plans for making the most of a great family holiday on the island. Can you imagine taking a trip to the Moon? Well, for the time being, this is about the closest you’ll get. The kids will adore the lunar landscapes that can be explored on a day out that is both fun and educational. This is a bus tour that makes several stops to allow visitors to discover the fascinating volcanic shapes and formations. At the end of the route, they will have the opportunity to feel the heat that the volcanoes continue to emit even today. Children will have the chance to observe how a geyser shoots out a spectacular jet of steam when water is poured into a crater. What’s more, the nearby restaurant serves chicken roasted using the heat from the actual volcanic soil. A camel ride adds the perfect finishing touch to this journey of exploration around the lunar landscape. Guaranteed fun and laughter for the little ones, this short ride is an experience they will never forget. A tour of the Verdes Cave (Cueva de los Verdes), an underground gallery formed by volcanic eruptions, is another highly recommendable day out on the island. 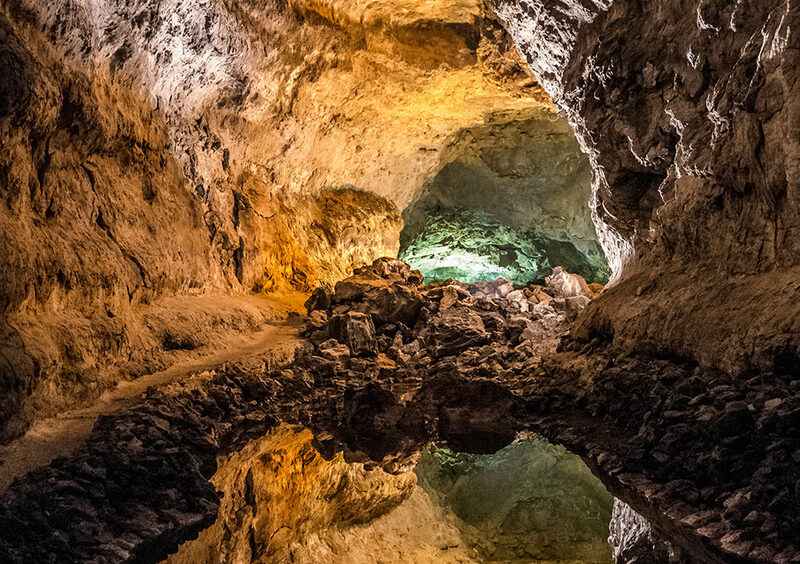 Children will love going deep inside the earth and will feel like authentic treasure hunters. This cave holds a fascinating secret that only those that visit it can discover. Are you brave enough to find out for yourself? Everybody loves a day on the beach. Basking in the sunshine and splashing about in the sea is one of the activities visitors to the island can enjoy 365 days a year. Your little ones will have a ball playing in the sand, paddling in the sea and enjoying a leisurely family day out. Nestling in the south of the island (Playa Blanca), this is a vast expanse of golden sands bathed by crystalline waters stretching out for a kilometre and a half, with 3 beaches dotted with coves. It can be accessed by car and there is also a car park. This is a quiet beach where children are able to play in complete freedom. Snorkelling is one of the most appealing activities on offer in Puerto del Carmen. Indeed, Playa Chica is a spectacular beach that is perfect for this activity. The wide range of sea life and numerous diving clubs located in this area guarantee a fun-filled afternoon for children, spent swimming among the fish. The Rancho Texas theme park is one of the myriad leisure activities on offer in Puerto del Carmen. A Texas-themed zoo where children can have fun watching performances by sea lions or birds of prey. Apart from the chance to observe a wide range of birds and animals close up, a day spent at Rancho Texas is one of the ‘wildest’ experiences to be enjoyed on the island. A day out at a water park always goes down a treat with the kids; after all, who doesn’t love having fun on the water slides and in the wave pool? Children will have guaranteed fun and games going up and down the slides…time and time again of course! 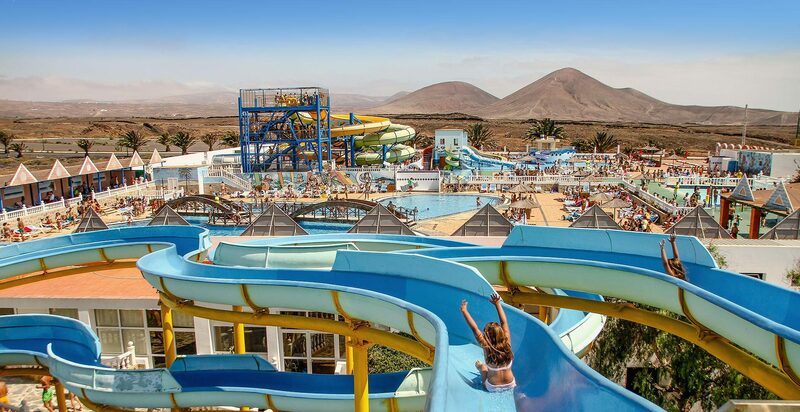 So we strongly recommend a trip to this waterpark located in the north of the island. In addition to the 15 attractions designed for all the family, it also has a 10D cinema and a paintball field. Please note that the park is closed in January, February and March. Probably a more relaxing plan than the other options on our TOP 8. No holiday on the island is complete without a visit to Teguise, site of the island’s most famous street market. A gentle stroll around the market admiring the island’s arts and crafts is something the entire family can enjoy. Children will love the balloons that decorate the stalls, as well as the sweets and candies on sale along the promenade. How many times have you experienced the sensation of a plane landing right over your head? Well, now you can start counting! This is an activity children love and Lanzarote is the perfect place to enjoy it! They love the sensation of a plane passing just a few metres above their heads. Apart from enjoying a pleasant stroll along the beach, you’ll be able to watch the planes landing and take some amazing photos. The best place is in Puerto del Carmen, at the far end of the Camino Guacimeta promenade.